An international team of scientists funded by the National Science Foundation (NSF) and the United Kingdom’s (U.K.) Natural Environment Research Council (NERC) has discovered a previously unknown volcanic hotspot beneath the massive West Antarctic Ice Sheet (WAIS). Their findings were published in the June 22 edition of the journal Nature Communications. Tracing a chemical signature of helium in seawater, an international team of scientists funded by the National Science Foundation (NSF) and the United Kingdom’s (U.K.) Natural Environment Research Council (NERC) has discovered a previously unknown volcanic hotspot beneath the massive West Antarctic Ice Sheet (WAIS). Researchers say the newly discovered heat source could contribute in ways yet unknown to the potential collapse of the ice sheet. The scientific consensus is that the rapidly melting Pine Island Glacier, the focal point of the study, would be a significant source of global sea level rise should the melting there continue or accelerate. Glaciers such as Pine Island act as plugs that regulate the speed at which the ice sheet flows into the sea. The new research was published by an international team, led by Brice Loose of the Graduate School of Oceanography at the University of Rhode Island. His research was supported by an award from NSF’s Office of Polar Programs, which manages the U.S. Antarctic Program. Researchers from East Anglia and Southampton universities in the U.K., Arizona State University, the Woods Hole Oceanographic Institution, and the British Antarctic Survey contributed to the study. an international team of scientists funded by the National Science Foundation (NSF) and the United Kingdom’s (U.K.) Natural Environment Research Council (NERC) has discovered a previously unknown volcanic hotspot beneath the massive West Antarctic Ice Sheet (WAIS).an international team of scientists funded by the National Science Foundation (NSF) and the United Kingdom’s (U.K.) Natural Environment Research Council (NERC) has discovered a previously unknown volcanic hotspot beneath the massive West Antarctic Ice Sheet (WAIS). Peter Milne, program director for ocean and atmospheric science in NSF’s Division of Polar Programs, noted that the discovery adds significant information about what controls the stability of the Antarctic ice sheets. The researchers first noted the volcanic activity in 2007 and verified its existence again in 2014. It remains unclear how the newly discovered activity affects knowledge about the glacier, because researchers don’t yet know how volcanic heat is distributed along the bottom of the ice sheet. However, researchers do know that the heat from the volcano is producing melting beneath the ice sheet. This meltwater is leaking across the grounding line where the ice shelf meets the ocean. The heat source, Loose and team note, is about half that of the active volcano Grímsvötn, in Iceland. While the effects of volcanic heat on the Antarctic ice sheets is an active topic of research, this study provides the first geochemical evidence of a contemporary volcanic heat source, emphasizing the need to detect and understand volcanism, including in models of ice-sheet behavior. The greater understanding of volcanism could alter scientists’ perception of the mechanics of ice-sheet loss, including in the areas where the glaciers meet the sea. “Our finding of a substantial heat source beneath a major WAIS glacier highlights the need to understand subglacial volcanism, its interaction with the marine margins and its potential role in the future stability of the WAIS,” they write in the Nature Communications article. 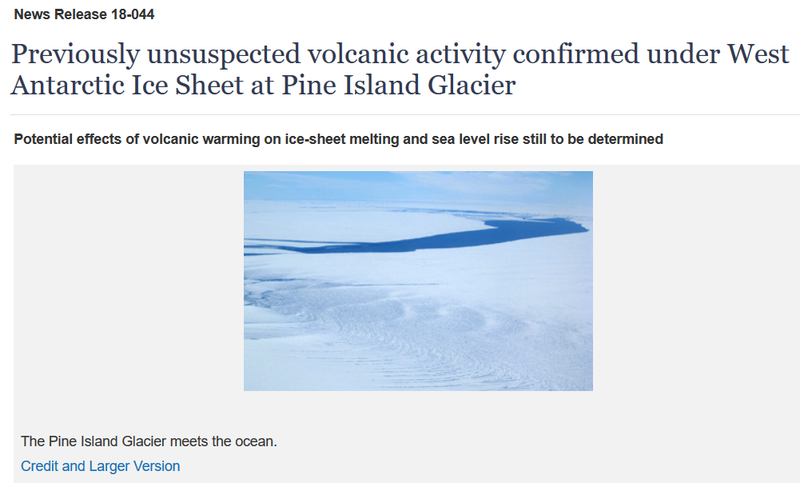 They also note that volcanic activity could be increasing the rate of collapse of the Thwaites Glacier, which is adjacent to the Pine Island Glacier. A complete collapse of the Thwaites Glacier could significantly affect global sea levels, according to scientists. The Thwaites already drains an area roughly the size of the state of Florida, accounting for about 4 percent of global sea level rise — an amount that has doubled since the mid-1990s. NSF and NERC announced in April that they would jointly spend $25 million in grants to researchers, and a comparable amount in logistical support, to deploy teams of scientists from U.S. and U.K. institutions to Antarctica to gather the data needed to understand whether the Thwaites glacier could begin to collapse in the next few decades or centuries from now. The research collaboration, called the International Thwaites Glacier Collaboration (ITGC), was announced at the British Antarctic Survey (BAS) headquarters in Cambridge, England in April. The collaboration’s scientists will begin their first research season in Antarctica in October, establishing a logistical support structure for future work. The collaboration will continue until 2021.